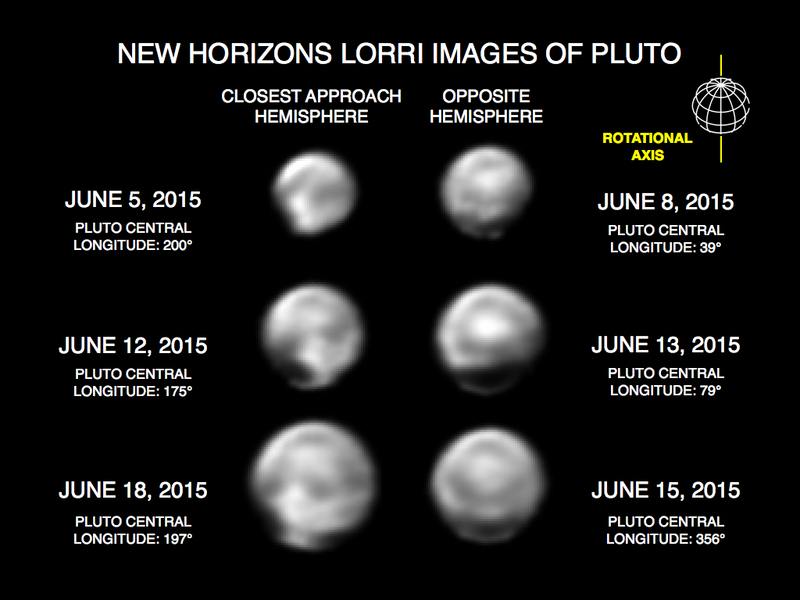 Features on the Close Approach Hemisphere: These images, taken by New Horizons' Long Range Reconnaissance Imager (LORRI), show numerous large-scale features on Pluto's surface. The distance to Pluto ranges from 47 million kilometers (about 29 million miles) on June 5 to 31 million kilometers (19 million miles) on June 18. When various large, dark and bright regions appear near limbs, they give Pluto a distinct, but false, non-spherical appearance. Pluto is known to be almost perfectly spherical from previous data. These images are displayed at four times the native LORRI image size, and have been processed using a method called deconvolution, which sharpens the original images to enhance features on Pluto. A Dark Mystery on Charon: These recent images show the discovery of significant surface details on Pluto’s largest moon, Charon. 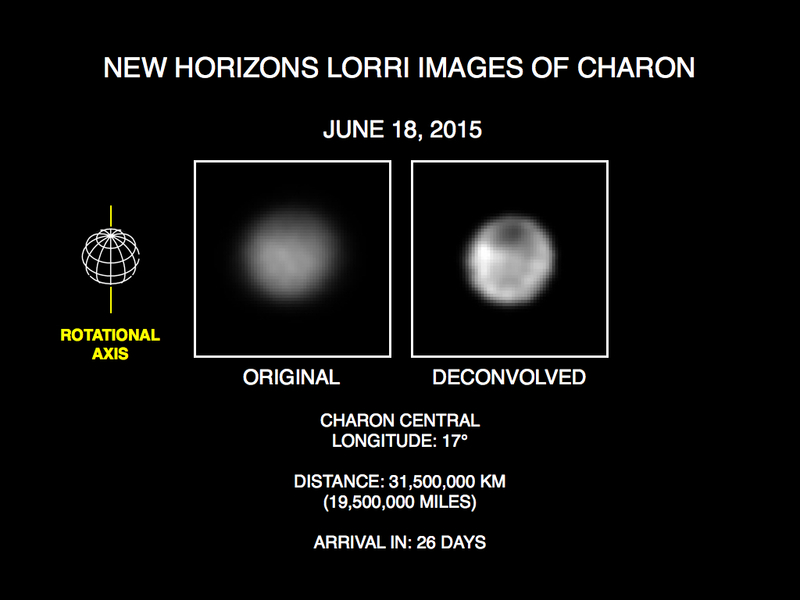 They were taken by the New Horizons Long Range Reconnaissance Imager (LORRI) on June 18, 2015. The image on the left is the original image, displayed at four times the native LORRI image size. After applying a technique that sharpens an image called deconvolution, details become visible on Charon, including a distinct dark pole. Deconvolution can occasionally introduce "false" details, so the finest details in these pictures will need to be confirmed by images taken from closer range in the next few weeks. Features on Pluto and Charon: Over the course of this "movie," assembled from a long series of images obtained by New Horizons’ telescopic Long Range Reconnaissance Imager (LORRI) May 29-June 19, Pluto and its largest moon, Charon, appear to more than double in size. From this rapidly improving imagery, scientists on the New Horizons team have found that the “close approach hemisphere” on Pluto that New Horizons will fly over has the greatest variety of terrain types seen on the planet so far. The movie is "Plutocentric," meaning that Charon is shown as it moves in relation to Pluto, which is digitally centered in the movie.